♥Wearing: Forever 21 Rib Knit Collar Bomber in Black; Forever 21 Fab Striped Sweater Top in Black/Cream; Xhilaration Seamed Legging in Black via Target; Alloy Maxie Boot in Black; Owl Face Ring in Black/Silver via Forever 21. ♥Reading: I Am Number Four by Pittacus Lore. Gah! If loving books is wrong, I don’t want to be right. Seriously. Je suis dans l'amour avec ce livre! Now release the sequel tout de suite, s'il vous plait! I may die if I don’t find out what happens next! ♥Glamourizing: Nails: Essie Mint Candy Apple. Lips: mark Glow Baby Glow Hook Up Lip Gloss in Peek-A-Boo. Eyes: Maybelline New York Cover Stick Corrector Concealer in Ivory. ♥Listening: Stuttering by Fefe Dobson. Trois acclamations for Fefe’s comeback - aimer l'amour her music! ♥Adoring: American Apparel’s Nylon Spandex Stretch Lace Long Sleeve Mini Dress in Crème, Black, Pink, Dusk, or Navy. The quintessential coquettish piece for testing le art of seduction; wouldn’t you agree, mes amours? Buffy the Vampire Slayer marathons. If ever I am permitted the chance to indulge in a second life, I should like to be reincarnated as one Ms. Buffy Summers. No hero and/or heroine could ever hold a candle to le slayer herself. Amore! Ballerina-inspired accoutrements that make one long to dance and twirl like an enchanted Sugar Plum Fairy a la BCBGMAXAZRIA’s Tulle Tutu Skirt, BCBGMAXAZRIA’s Lace Dress with Draped Skirt, and Club Monaco’s Olga Tulle Skirt. ♥Watching: Dr. Seuss’ How the Grinch Stole Christmas. Un petit confession, lovers…I still have my Cindy Lou Who Doll, and would not part with her for anything in le world. J’adore both her and the film itself! ♥Desiring: Velvet’s Dixon Ombre Sequin Cardigan. Already I am in possession of a sequin miniskirt and top; a sequin cardigan would round out my sparkly wardrobe quite well, mais oui? Pretty Little Liars Season 1 DVD Boxset. I have already read the books; now I devoir see the show! Trouve Alliance Wedge Bootie. Do I need? Non! Do I want? Oui, chronomètre l'infinité! ♥Awaiting: Alloy’s Cullen Boot in Taupe. A good over the knee boot is hard to come by, mais oui? I thought that these looked spectacular; therefore, they are now on their way to my welcoming arms. Amour! Thanks to Passports & Prada for the picture. Don't forget to enter the I Want Chocolate Giveaway for your chance to win a Front Lock Clutch in the color of YOUR choice from Chocolate Handbags. BUFFFFFFFFFFFY. For one of my English Honors classes my last year at college, I took Women Warriors (feminist lit class). My final thesis was on Buffy the Vampire Slayer. HOLLA. Good over the knee boots ARE so hard to find--and I'm 5'11, so they're always too short. I just scored a pair from Nordstrom Rack for like 50 bucks, and they are well over my knee. They must be thigh highs. Awkwardddddd but I love them. I remember Fefe Dobson! Glad to hear she's back with a new single :) I'll have to chekc it out! I was wondering if I Am Number Four was a book! I'm seeing the previews for the movie. love that Voltaire quote... s a s S y ! oh the sequined cardy is sold out but so fabulous! did you watch season 2 premiere of pretty little liars? I love mint colored nailpolish! Ballerina skirts and Buffy? We are so kindred spirits! Loving the boots you are wearing! Thinking about grabbing them in natural... And that club monaco skirt is sooo cute! Wow I am REALLY loving those OTK boots you are awaiting. Temptations!! Those Alloy boots look so gorgeous! Go for it, doll! I'm in LOVE with those Alloy boots. FUN! Great color too. E, if you knew how much I admired Buffy. Ah, the Buffy love never ceases. Alas, I know for sure that I would look totally awkward in the American Apparel Spandex Dress. As for the boots. I wish I could wear heels as much as you do. Jealous! Have a good Wednesday! P.S: You need a blog button so I could put it on my blog. That lace mini dress is gorgeous! Especially loving the AA dress and that Voltaire quote! oh my gosh! i am in love with that picture!!!! and i'm loving the american apparel dress! Those are fabulous boots, love them! I am so looking forward to that movie, too..from the I Am Number 4. I love this picture. Its so beautiful. This is an amazing picture, and your blog is also fabulous I am loving it! i love these posts of yours! my dog has been really sick these past few days, so i've spent them at home with her, poor thing..
Love the color of Essie's Mint Candy Apple. Happy 2nd Blogiversary! I love the things you chose! Wow, some very cool details. love the photo image. so romantic! The Cullen boot is amazing...I absolutely love it! on an aside...I love how you effortlessly go back and forth between french and english on this particular post every week. Kinda makes me wish I was bilingual...but I can barely master english! Oh well...hope you're having a great week! Erika those boots are SWEET! And I only caught the tail end of the Grinch on the 23rd...I think I need to buy the dvd and indulge! Please Please dont die before the sequel comes out! That would be too tragic. I am wearing a Aryn K taupe silk and chiffon Tee shirt, a pair of custom leather pants I have had forever and hot rollers..... Getting ready to go out! Your outfit sounds fabulous. I love the boots. You can never watch 'How The Grinch Stole Christmas' too many times. I love that movie. I love that Voltaire quote! My favourite, though, is probably how he responded to a request to renounce Satan on his deathbed with "My dear man, this is no time for making enemies"
You're always keeping it faboulous dear:D I wish I could see all this on you though! Have a nice day! those wedge booties are phenom! and I love mint nail polish. I have a bottle that I adore. Love that sequin cardigan! Absolutely darling. I never saw that Dr. Seuss movie. Need to! Ooh love that hair! Ooh and Fefe Dobson, I need to look her up again! I have I Am Number Four but I still need to read it. LOL At least you have the movie coming out!! That Essie color sounds so pretty!And I love that American Apparel dress--so cute! hope i don't go completely bananas. Amber Gray is absolutely my favorite photographer ever. That is one of my favorite photos of hers. Love your post as always!!! Love that quote & that is such a stunning photo! This is the loveliest post! love the Alloy over the knee boots!! Love the picture! 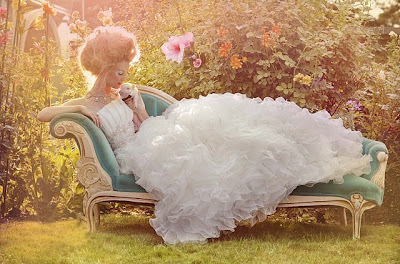 I think I first saw it in a Bridal magazine :P Let me know how I Am Number Four is, I've been wanting to check it out! I'm reading Kitchen Confidential by Anthony Bourdain and highly reccomend it! LOVE love LOVE the dress/skirt, its so whimsical and stunning. Really like this about you post :) Love your blog layout, the color matching is phenom! forever21, american apparel, and dr. seuss? love it sweetie! did you know they are making a movie based on that book?